Puzzle games are some of my favourite titles for the Android because of their tendency to play well in short bursts. Rebirth looks to take the gameplay behind Lumines and bring it over to the mobile market: the question is, will it do the original justice? For those looking for a basic clone of Lumines (more on that later), you've come to the right spot. 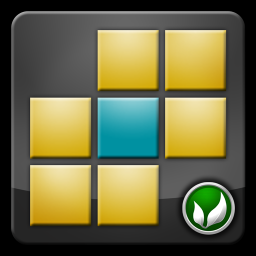 Rebirth is pretty much the game to a "T", and brings the block-stacking madness to the Android platform with good faith. 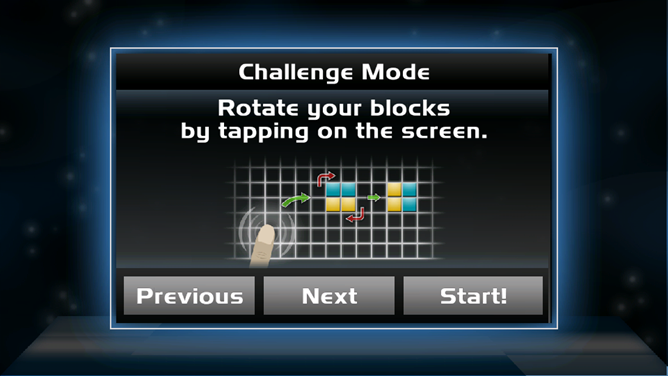 For those unfamiliar, Lumines was a puzzle game that was first developed for the Playstation Portable System. 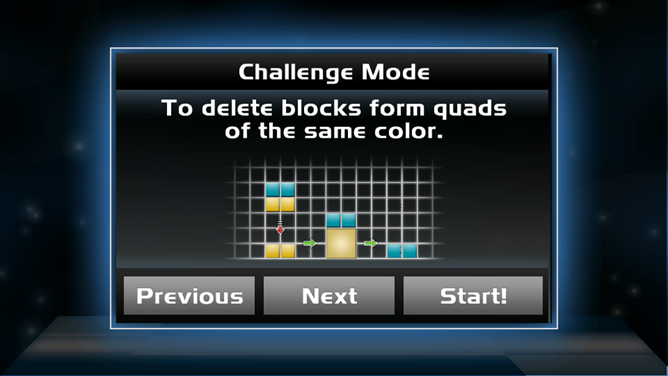 While playing, you would maneuver 2X2 blocks which were comprised of blocks colored either "light" or "dark." Making 2X2 squares out of these dropped blocks would fuse them together, and they would be cleared by a passing "clear line." Blocks were affected by gravity, so when squares were cleared, the remaining pieces would fall, opening up the potential for combos. 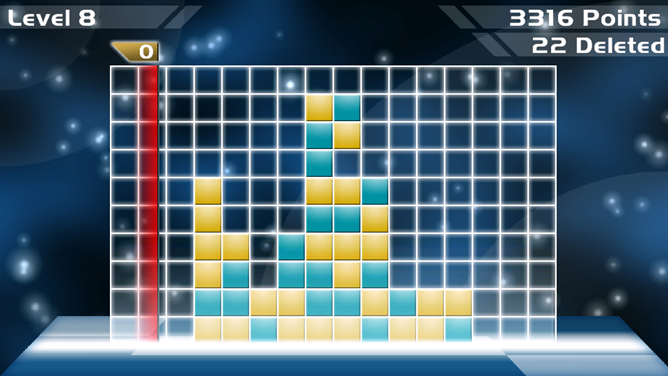 Developed by the same minds that gave us the acid trip known as Rez (for the Dreamcast and Playstation 2), Lumines was designed to be a puzzler with music elements: different skins would affect the game elements, like how fast the blocks would clear. If background music had a faster tempo the clear line would move faster and would limit the amount of blocks you could join before they were erased. However, having a slower clear line meant that the danger of the playing area filling up to the top was increased. Like I said above, Rebirth seems to be a very basic port of Lumines: since there aren't any skins that change the gameplay, it can be considered the "vanilla" experience. 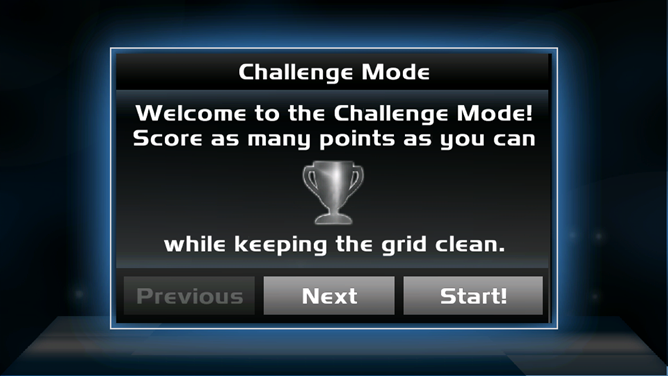 In order to add a little bit of variety, though, players can take part in a Time Attack or Endless ("Challenge") mode. The former involves seeing how high a score you can get in two minutes, while the latter keeps going until you cannot stack any more tiles. Controls are completely handled by touch; tapping anywhere on the screen will rotate the block, while swiping left and right will move it. 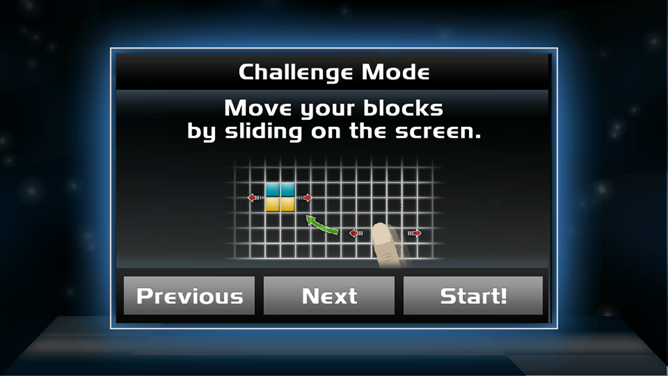 Swiping down will drop the block - controls you'll recognize if you've ever played a touch version of Tetris. Rebirth has a layer of polish that I'm particularly impressed with: things like having a computerized voice that announces your menu options and the shine on the cubes makes the game appealing, visually. I point this out because there have been a number of "concept ports" that are just content to take the gameplay of a title and not the design that comes behind it. Too many times have we seen Tetris clones where the interface is an un-navigable mess, or the blocks look atrocious: it's not until we find one with polish that we feel the app truly shines (no pun intended). 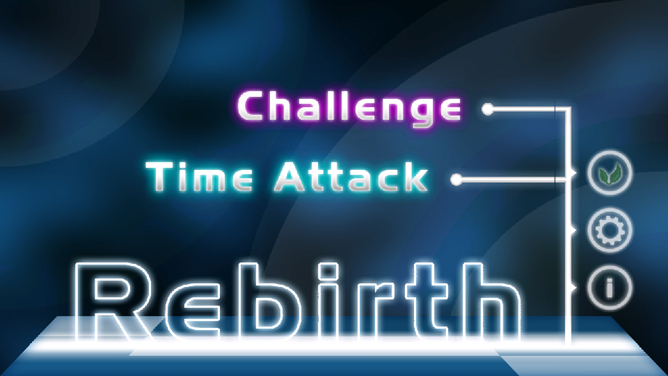 Rebirth could have gotten away with taking the gameplay from Lumines while not putting any effort into the way it was presented. However, as that presentation is such a big part of the original experience, keeping it in made the adaptation more faithful. However, was it too much to ask to include the skin/music functionality? Rebirth is a free download, which earns it some points: I couldn't imagine paying for it unless there was a greater attempt to capture the entire Lumines experience, not just the basic concept. To be frank, the inclusion of skins and music-affected gameplay is something that would add a lot of depth to the title. Other criticisms include a particularly loose control scheme that takes some getting used to: tapping often causes the block to shift left, right, or down, which can sabotage gameplay a little bit. It takes some discipline, but you can adapt to it. If I can take some time, I'd like to make a note to developers: while it isn't exactly illegal to charge people for an app that's simple in focus, it's a bit unethical to market your product around being a clone and then charge for a gimped experience. This is why I'm happy that the devs of the Might and Magic 2 (Free Heroes 2) and GemRB (which allow you to play Baldur's Gate, Icewind Dale and Planescape: Torment) engines don't charge for their apps: it just seems a little low to charge for what someone else has innovated. While they do deserve credit for coming up with an engine that works on a mobile device, they didn't price it exorbitantly: that's what kept me from buying a lot of the emulators available on the Market before they got pulled. However, this doesn't mean that if you take the time and effort to add your own flair, you shouldn't be compensated: by my above logic, every Tower Defense game would just be swept under the rug as a clone. Instead, developers should realistically look at what they're offering and value it accordingly, if it's priced along with what consumers think is reasonable, they'll likely find success.